Proton-exchange membrane fuel cells (PEMFCs) are generally regarded as a clean and sustainable energy-conversion technology to replace increasingly scarce fossil fuels due to the high energy conversion efficiency, high energy density, and low or zero pollutant emission. 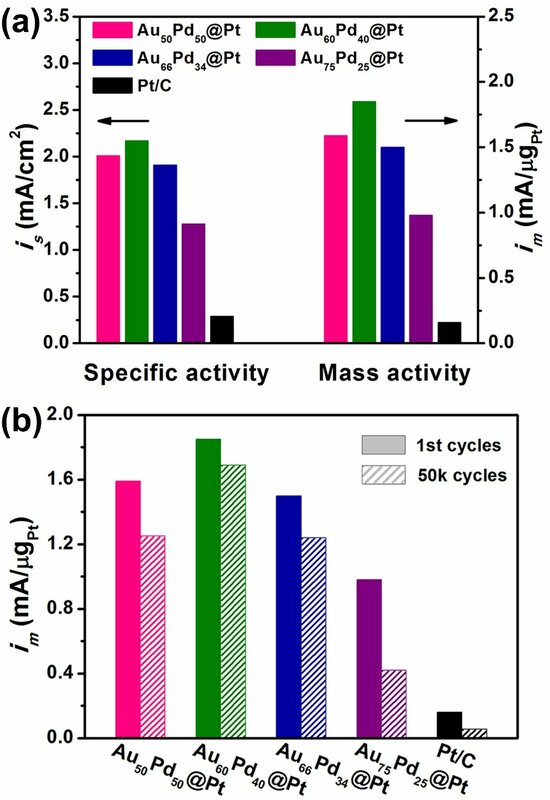 Clearly, platinum (Pt) is a key component of the state-of-the-art electrocatalysts for the oxygen reduction reaction (ORR) at the cathodes by far, which is a determining half reaction to boost the performance of this fuel cell technology. However, the sluggish reaction kinetics of ORR often requires a relatively high load of Pt to achieve a desirable fuel cell performance in the practical applications, which is severely restricted by the high cost and scarcity of Pt. As such, researchers have made tremendous efforts to develop active, stable, and economical Pt-based catalysts towards ORR over the past decade. Incorporating Pt with less noble and/or low-cost metals to form alloy/core-shell catalysts is regarded as a promising strategy to substantially enhance the catalytic properties towards ORR in fuel cells due to electron coupling and strain effect between distinct metals. Compared with Pt-based alloy electrocatalysts, such core-shell electrocatalysts not only avoid the leaching or dissolution of the non-Pt metal to improve stability, but also make full use of every Pt atom and thus cut down the cost of catalysts.